Scarlet Bee Balm attracts bees and hummingbirds. You get more new flowers in your garden next year. If you’re a little tired of the bulb selection on offer, here’s your chance to explore whole new varieties of perennials. The bees, butterflies and birds get the benefit of more food choices. I say almost utter abandon because planting any kind of seed at any time of the year does take a little care. But the process can be as simple as smoothing out a patch of earth, sprinkling the seeds, tamping them down into the soil and giving them a quick watering. You’ll find a great preview to planting flower seeds on the American Meadows website. Check out Why Many Experts Feel Fall Planting Is Best which includes a step-by-step on How To Plant Wildflowers In The Fall. Another terrific resource is Ontario-based Wildflower Farm’s website. Their book, Taming Wildflowers, is the bible for growing your own native blooms. Here are nine Canadian native flowers to plant by seed in late fall that are really hardy (all the zones listed below are for Canadian gardens) and deliver gorgeous blooms (many with a lovely fragrance). I’ve arranged them by bloom time so if you’re really ambitious, you could plant them all for a continuous display from March to October. Prairie crocus (also called Pasque Flower) (Pulsatilla patens) I’m not sure what’s cuter about this small spring flower–the delicate purple blooms that can appear when snow’s still on the ground or the fern-like leaves covered in silky hairs. It’s a native to parts of the Yukon and Northwest Territories as well as from British Columbia east to Manitoba. Hardy to zone: 2. Bloom time: March to April. Soil: Medium to gritty, average to dry. Must be well-drained. Sun: Full sun. Seeds are available from Wild About Flowers, an Alberta-based nursery specializing in wildflowers. Wild columbine (Aquilegia canadensis) This plant looks fragile with its gorgeous red and yellow multi-chambered blooms but it’s actually a prolific self-seeder. So you might only need to sow seeds once this fall and then let nature take its course. A native to eastern North America, it’s a welcome sight every spring in my neck of the woods on the Bruce Peninsula in Ontario. I plan to scatter a lot of the seeds around my cottage in amongst the moss-covered stones. Hardy to zone: 3 Bloom time: April to May. Soil: Average, from sand to clay, well-drained. Sun: Full sun to part-shade or dappled shade. You can get a packet of seeds as well as larger quantities from Ontario-based Wildflower Farm. 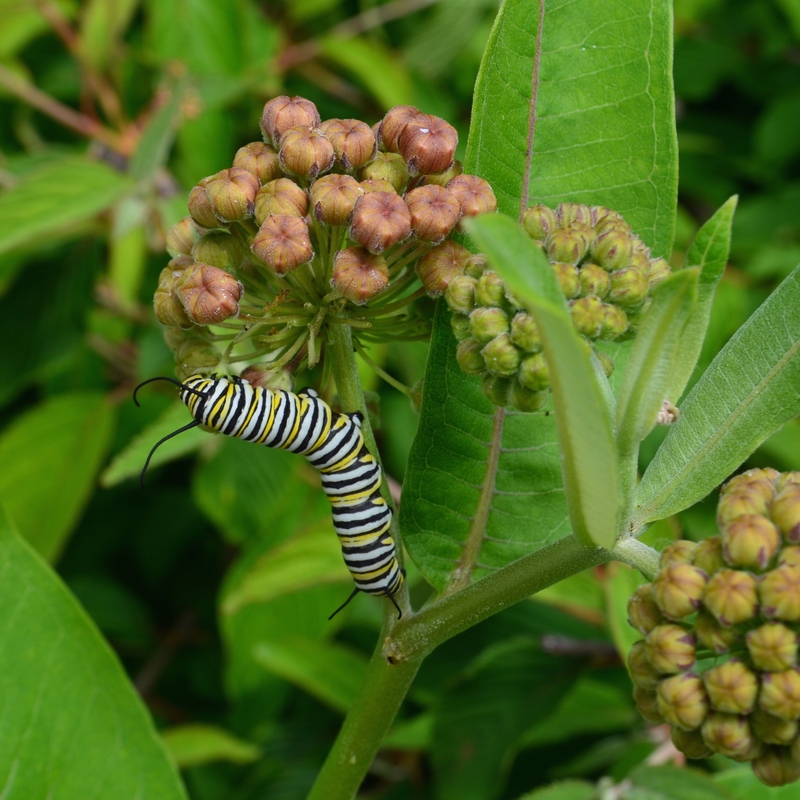 Plant Common milkweed seeds now to feed those hungry Monarchs next summer. Foxglove beardtongue (Penstemon digitalis) Native penstemons are a wonderful addition to the garden not only for their tall spikes of bell-shaped blooms in shades of white or mauve, but because they’re drought tolerant and not particularly picky about the soil they find themselves in. Hardy to zone: 3b. Bloom time: June, July. Soil: Medium to dry. Sun: Full sun to part shade. Seeds are available from Prairie Moon Nursery. Common milkweed (Asclepias syriaca) Not to be outdone by its bright orange cousin Asclepius tuberosa, famous for supporting Monarch butterflies, Asclepius syriaca, with its pinky mauve flowers, is also a native to most of eastern North America and an important food source for butterflies. Hardy to zone: 3. Bloom time: June to August. Soil: Dry to medium. Can be sandy or rocky but must be well-drained. Sun: Full sun. Check out OSC Seeds for packets of seeds for this plant as well as bright orange Butterfly weed (Asclepius tuberosa). 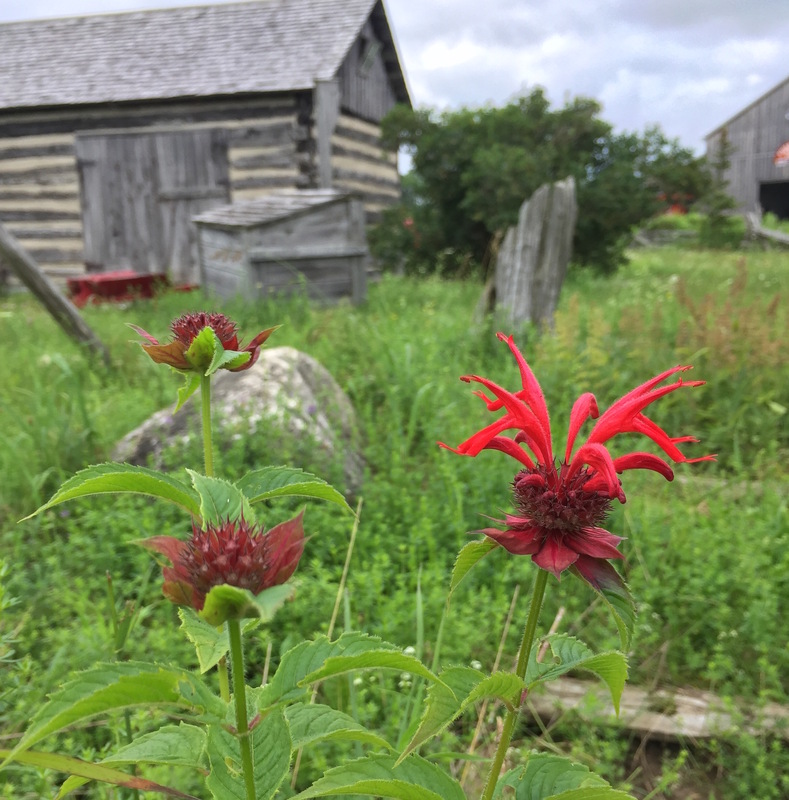 Scarlet Bee Balm (Monarda didyma) Bee Balm is a native wildflower of Ontario, Quebec and New Brunswick. As its name implies, this eye-catching flower is loved by pollinators. Add some of these beauties to a rain garden for an extra zing of colour. Hardy to zone: 4. Bloom time: July, August. Soil: Moisture-retentive, medium, moist to wet. Sun: Full sun to part shade. Try the Monarda didyma mix of scarlet and pink blooms from OSC Seeds. 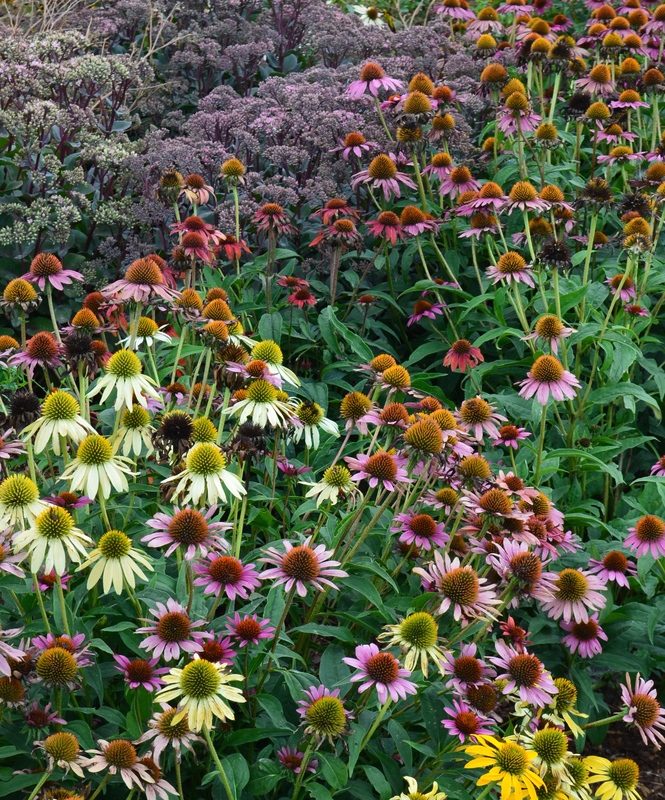 Echinacea is a classic fall flower that doesn’t get credit for being so easy to add to a garden. Coneflower (Echinacea) Although this tried-and-true summer dazzler can only lay claim to being native (or introduced) in a small portion of central Canada, coneflower has all the attributes of a robustly wild thing, self-seeding with abandon and perennially withstanding our harsh winters to deliver a rainbow of colours to the late summer garden. Hardy to zone: 3. Bloom time: June to September. Soil: Dry to medium. Can tolerate shallow or rocky soil. Sun: Part shade. Try Halifax Seeds for a variety of echinacea choices including single species and Echinacea mixes. Joe Pyeweed (Eutrochium fistulosum) Though it may take you two years before you’ll see this plant bloom if you grow it from seed, it’s worth the wait. Stretching well over a metre tall with clouds of pink, vanilla-scented blooms, this wildflower is native to the entire lower half of Canada and a fair amount of the U.S. Since it can get top heavy, grow this flower at the back of a border or surrounded by other tall, shrubby plants that can lend it a little support. Hardy to zone: 3. Bloom time: July to September. Soil: Moist to wet. Don’t let the soil dry out with this plant. Sun: Full sun. Go to OSC Seeds for packets of seeds. White musk mallow (Malva moschata ‘alba’) Ingloriously labelled as a weed by the province of Ontario, this introduced wildflower can be found in British Columbia and parts of the eastern half of Canada from Manitba to Newfoundland. But some discerning seed purveyors still tout the flower as an indispensable addition to the romantic cottage garden. I agree. It helps that the snow white flowers, with their blush pink stamens, have a lovely fragrance. Hardy to zone: 4. Bloom time: July to September. Soil: Average. Sun: Full sun to part shade. Find seed packets at The Cottage Gardener. 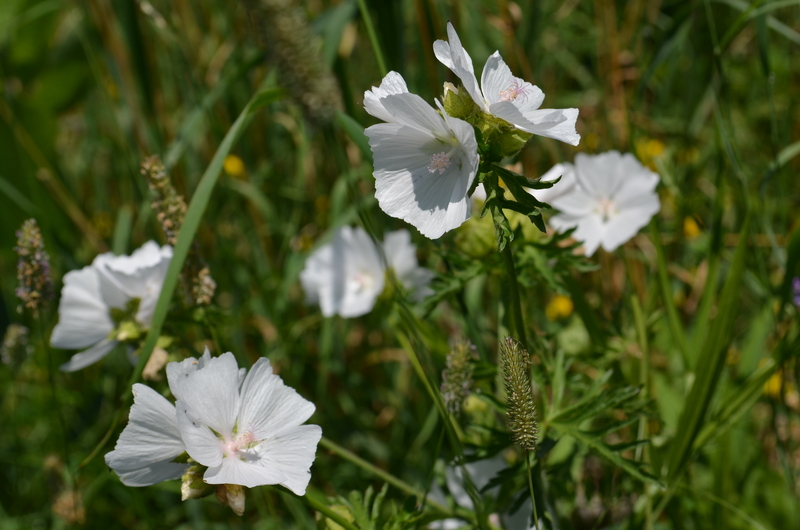 White Musk Mallow (Malva moschata ‘alba’) will happily bloom all summer long after being planted in the fall. Black-eyed Susan (also known as Brown-eyed Susan) (Rudbeckia hirta) Growing into large, sturdy metre-tall clumps covered in eye-searing yellow blooms with their distinctive dark eyes, this perennial works wonders at adding both colour and structure to a border. Hardy to zone: 3. Bloom time: June to October Soil: Does well in rich soil but will tolerate clay so long as it’s well-drained. Sun: Full sun. Try Wildflower Farm for packets of seed as well as larger orders. If you’re interested in other options for direct sowing, hop over to my post “Ideas for easy, direct sow vegetable gardening” and “No Space, No Time Veggie Growing Guide”.